No other tool in the world can flatten edges on boards as efficiently or quickly as a Jointer can. 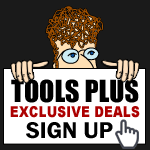 Tools Plus carries many different makes and models of jointers. If you're tight on space and working mainly on smaller projects, then a benchtop jointer is perfect for you. Alternatively, there are also free-standing units which are great for large heavy duty tasks in woodworking shops. We offer many popular jointers from manufacturers like JET and Powermatic.